Add a touch of simple charm to your cabinets with this Martha Stewart 1 in. Bedford Brass Goblet Knob. Installation is easy with the included hardware. The Brass finish offers a clean, fresh look. For the 1-5/16inch Classic Elegance Cabinet Knob by Liberty the name says it all. The grandeur of this knob paired with the silken Brushed Brass finish makes an impressive style statement. Easily upgrade your kitchen and bathroom cabinetry with a simple installation of this beautiful cabinet knob. The clean lines of the 1-1/8inch Simply Geometric Cabinet Knob provide an eye-catching modern flair to your cabinetry. 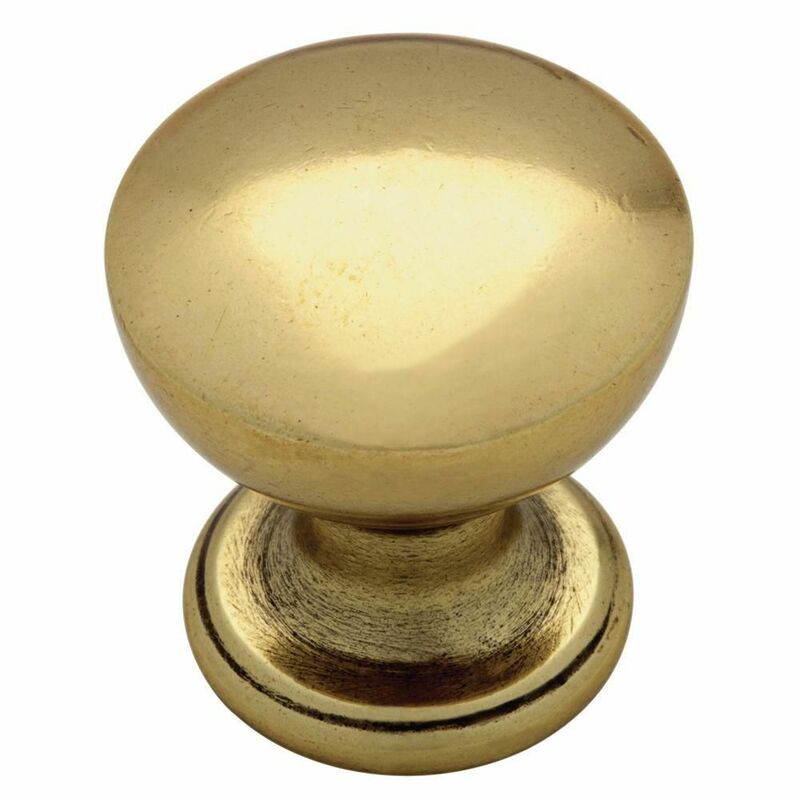 In a stately Brushed Brass finish, this gorgeous knob turns the mundane into the magnificent. Instantly transform the look and feel of your kitchen or bathroom with this easy install. The clean lines, smooth planes, and lustrous finishes of Mid-Century design are beautifully represented in Martha Stewart Living's Modern hardware group. Casual and elegant, the Medallion Knob has a bold silhouette combined with subtle detailing and a soft finish of Polished Nickel, creating an enviable look for any room. 25mm Goblet Knob Add a touch of simple charm to your cabinets with this Martha Stewart 1 in. Bedford Brass Goblet Knob. Installation is easy with the included hardware. The Brass finish offers a clean, fresh look. 25mm Goblet Knob is rated 4.5 out of 5 by 28. Rated 5 out of 5 by Lakegirl00 from I replaced some vintage pulls on an old dresser I... I replaced some vintage pulls on an old dresser I redid and I love the look of them! Rated 5 out of 5 by TheClassicButterfly from Nice, heavy pull. Very straightforward installation with two lengths... Nice, heavy pull. Very straightforward installation with two lengths of screws provided for different thicknesses. Really happy. Rated 5 out of 5 by Sheila from These 1" goblet cabinet knobs suit my application well. I was renovating a bedroom with built in ... These 1" goblet cabinet knobs suit my application well. I was renovating a bedroom with built in cabinet doors and drawers flanking built in dual closets. I needed knobs that weren't too showy; just something with "simple clean " lines that I was matching with cup pull drawer handles that Home Depot also carries online. Home Depot has been my go-to place to search for many of my home remodel needs. Rated 5 out of 5 by HomeDepotCustomer from They look lovely in my bathrooms and kitchen!... They look lovely in my bathrooms and kitchen! Rated 2 out of 5 by Scooterpie from The knobs were not the same color as either of the cabinet pulls. They vary color within the box ... The knobs were not the same color as either of the cabinet pulls. They vary color within the box and certainly do not look like this picture. They look more like copper and as if they were painted. The weight, shape and heft is wonderful but if the hardware doesn't match, it is unusable. Returning. Disappointing. Rated 4 out of 5 by lsh from this knob wasn't the one I wanted to match our cabinets' knobs (which we bought at HD a few years... this knob wasn't the one I wanted to match our cabinets' knobs (which we bought at HD a few years ago), but have you tried to match up something like a rounded brass knob from amongst the ~6,000 other knobs on their web site? IF you buy knobs, buy three extras of the same one, yes, THREE and keep them in the package.. Two to put on the new cabinet you added, and one left to be able to order the same part number that you had bought three years ago..... So, this one worked to use on the over the refrigerator cabinet which is obscured by stuff on the top of the refrigerator, and the knobs from those cabinets (part of the ones we bought a few years ago), went on the very seeable new cabinet. These are great knobs! But, they don't match the others on our cabinets. Rated 4 out of 5 by sometimesmom from Ordered these knobs and just installed them. They look... Ordered these knobs and just installed them. They look awesome with my new dark gray cabinets. Rated 5 out of 5 by HomeDepotCustomer from Great weight and look amazing! ... Great weight and look amazing! What are the dimensions? The online description says 1&quot; H by 3&quot; wide. That cannot be true.